That interesting Web article. The emailed order for your new Mac. The snapped picture of the label as a reminder of that terrific pinot noir you just drank. A quick audio note you make with your phone. Those hundreds of downloaded PDFs of bank, brokerage, and utility company statements. You’ve got the information—heck, you’re practically drowning in it. Now you need somewhere to put it. You need an Everything Box. That’s a program that can store and sort those clippings and files, index them for easy search and retrieval, and allow you to add your preferred organizational structure as well, whether it be to group similar kinds of information into collections, or add metadata such as tags or categories. Evernote is an Everything Box, as are other familiar Mac programs, such as Devon Technologies’ DevonThink ( ), Bare Bones’ Yojimbo ( ), and Chronos’s SOHO Notes, to name just a few. Where Evernote differs is that it’s free (with a paid Premium tier providing extra features), available for Mac and Windows and as a Web app, and it has native iOS and Android apps. Evernote automatically uploads everything you put into it to the company’s servers, making it available for syncing to all your devices. Evernote 5 is a major refresh of the program’s look and operations, and makes the service easier to use and more appealing than ever. See Your Notes Your Way: Evernote 5’s clean new interface includes notes presented in this new Card view, which gives you a nice preview of each note, with the main content in the large pane on the right. This shot also shows, at left, the new Shortcuts and Recent Notes, which give you quick access to your pinned and latest notes, respectively (click to enlarge image). The basic unit of information in Evernote is the note. You can collect similar notes in a notebook, creating as many notebooks as you need, or throw everything in one main notebook. You can add tags to notes to help categorize them further, and when you search for a tag, it finds notes with that tag in all notebooks. If your new item is a picture with words in it, Evernote will run optical character recognition on its servers to make the picture’s text searchable (even if the text is handwriting); the text then gets synced down to your Evernote clients with the rest of the note. Evernote gives you many ways of capturing new notes. You can type text notes directly in an Evernote client, or drag text, images, sounds, or videos into the program. You can also use the Evernote Web Clipper, an extension for Safari, Chrome, and Firefox, to snag all or part of Web pages. You can even email notes to Evernote. On the desktop, a menu bar extra allows you to create a new note, an audio note, or a screenshot, paste whatever’s on the Clipboard, and search the program. The Mac client allows you to use your FaceTime camera to snap pictures (but not video) of yourself or anything else you hold up to the camera. Both the Mac and iOS versions of Evernote record audio notes, but they are low-quality (with a sample rate of just 8 kHz), mono WAV files, optimized for small file size and speech quality. It’s understandable that the company wants to keep files that will be synced with mobile devices small, but it would be nice to have an option for higher-quality audio, even if that would just be for Premium accounts. 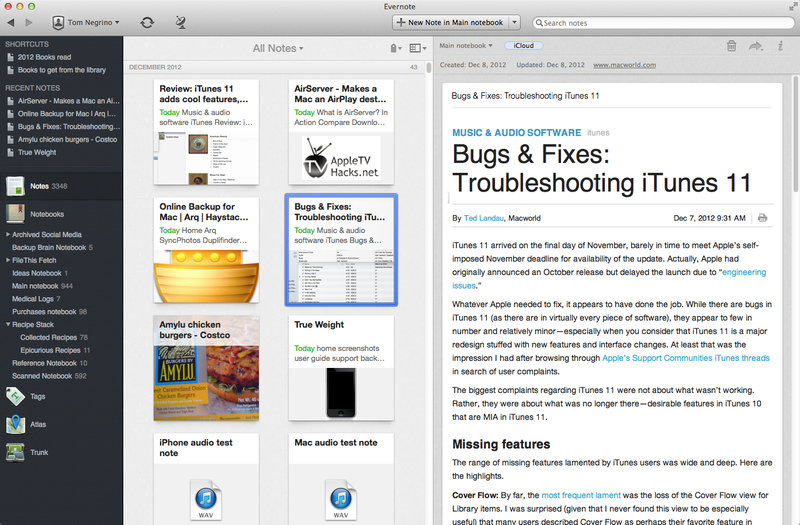 Evernote 5.0 for Mac gives the program a major refresh. The left column has sections for Notes, Notebooks, Tags, Atlas (a view that uses geotags in your notes, especially images, to show on a map view where that note was created), and Trunk (more about that later). New to the program are two areas at the top of the left column: Shortcuts, where you can pin frequently used notes; and Recent Notes, which gives you quick access to your latest work. You can right-click on Notebooks or Tags to show their contents in the left column, as in previous versions of the program. In the main part of the program window, where you view notes, are new Card and Extended Card views, and you can view notes by Notebook or Tag without doing a search. Speaking of which, searching for notes has been extensively improved, with type-ahead search that tries to anticipate your search string, and allows you to use note attributes as search tokens. As before, you can save searches for later use (now a smoother process). The note editor gains a bunch of small changes that make it easier to write with; you can choose a plain-text note or add basic formatting, including full-screen composition. I had a few minor issues with Evernote 5. Notes on one of my Macs did not sync at the set interval; I had to sync manually until I uninstalled and reinstalled the program on that Mac. I also had trouble searching on a particular tag, but while writing this review, two minor updates with bug fixes and a few new features were released, and the tag problem went away. Where’s That Note? 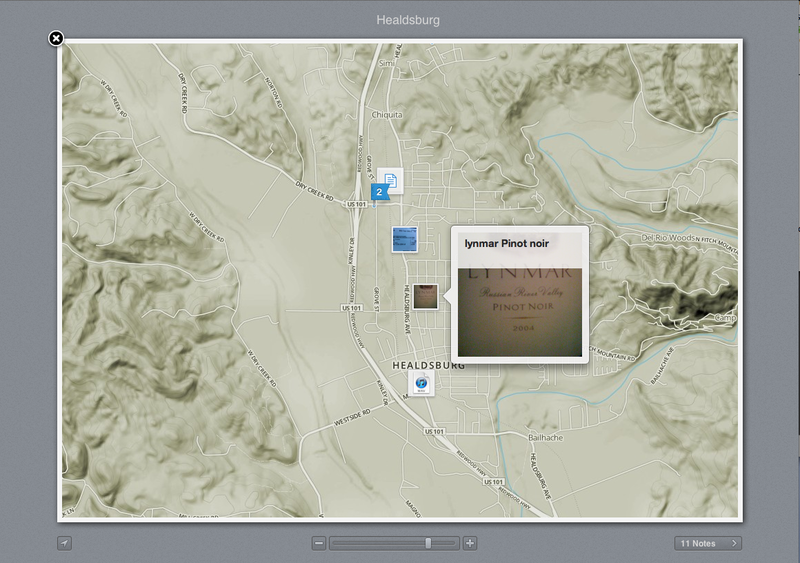 : The new Atlas view shows you a note's original or source location, if it's tagged with geographic information. You can get a preview of the note right in the Atlas. One of the most useful things about Evernote is the huge ecosystem that’s sprung up around it, consisting of hardware, software, and services that all use Evernote as their hub; Evernote calls its built-in access to these add-ons the Trunk. Some of these are owned by Evernote itself: for example, in 2011, Evernote acquired Skitch, a popular screen capture and annotation tool, which is now integrated with the Evernote program, with Skitch images syncing to an Evernote notebook. Other Evernote tools include Hello, a mobile app that makes it easier for you to remember people; and Penultimate (another acquisition), an iPad notebook app that works with Evernote’s handwriting recognition. But many other companies and developers work with Evernote. Numerous scanner manufacturers now have a scan-to-Evernote feature in their drivers. The Trunk lists dozens of mobile apps that enhance Evernote in one way or another; in addition, there are paperless services such as FileThis, which automatically connects to and downloads statements from credit card, brokerage, and utility companies and sends them to Evernote. The Evernote basic service and clients are free, and most users will be satisfied with that service (I used it for more than two years as a free account). The company says that approximately 96 percent of its users are free account members, who may upload up to 60MB of data per month (data can be of any type). Small ads appear in the client programs for free users. Advanced individual users can pay $5 per month or $45 per year for Premium features, such as a 1GB monthly upload quota; a capability to recognize text in PDFs and make it searchable (this feature, combined with my Fujitsu ScanSnap desktop scanner and a fervent desire to go paperless got me to upgrade to Premium); offline notebooks for mobile devices; shared notes and notebooks; the ability to hide the ads; and a few other features. The paid Evernote Business service ($10 per user per month) adds still more features for managing employee accounts and shared business notebooks and notes. Employees can keep their personal notebooks separate from their company notebooks. 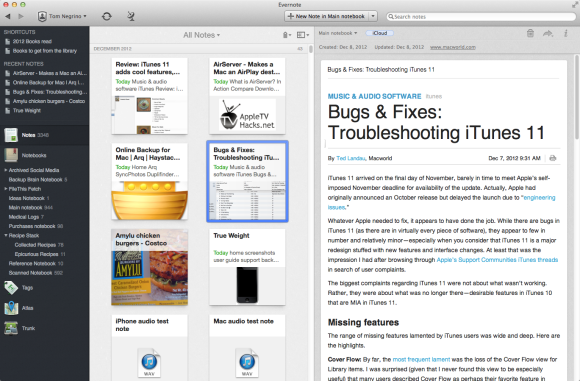 Evernote 5 is a major refinement to an already-good client for the Evernote service. The release of the Mac client roughly coincided with new versions for iOS as well, refreshing the entire experience. Whether you are among the large majority of free users of the service, or use an Evernote Premium account, you will benefit from the new client programs.